Valentine came to AAE with her mama, Martina, from the DreamCatcher Wild Horse and Burro Sanctuary in March 2018. Valentine was only days old. AAE has been supporting DreamCatcher's herd reduction efforts since April of 2017 after the long illness and passing of their Executive Director, Barbara Clarke, in November of 2016. Valentine was a curious and sassy little gal, and she had not been handled much. She wanted to know more about humans, but only from a distance. Valentine has been introduced to a halter and leading, and though she was initially opposed to the idea, after some thought, she learned quickly. 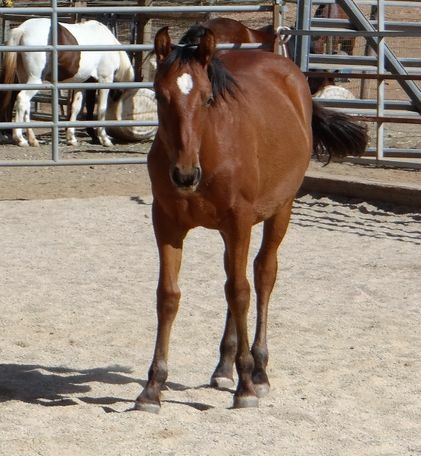 Valentine is very active and athletic, and she enjoys romping around with the other youngsters. She doesn't stray far from mom, but her independence is growing. She will no doubt be fun partner to grow with in a long lasting relationship. Valentine is current with vaccines and deworming. She is still learning about hoof care and farriers, but making very good progress. Valentine has a large umbilical hernia that needs surgical repair, and we are preparing to schedule soon. She'll be ready for adoption once she has recovered.